Legendary televised improv show Whose Line Is It Anyway? returns to London’s West End for 14 performances only. Back due to phenomenal demand, Whose Line Is It Anyway?...Live plays at the iconic London Palladium, 9-19 June 2016. Original co-creators Dan Patterson and Mark Leveson will once more be working with regular players Colin Mochrie, Josie Lawrence, Greg Proops, Brad Sherwood, Jeff Davis and Clive Anderson for a limited run. These performers are some of the best improvisers in the world, all with super dextrous minds and lightning reactions, ready to throw themselves into any nutty challenge fired their way by audiences and host Clive Anderson. From the bizarre to the ridiculous, no show is ever the same and anything goes. Competing in a series of exciting improv games, including making up songs on the spot, acting out films in other languages and rummaging through brave audience members’ handbags, this popular classic is as fresh and exciting as it has always been and the whole team are on hilarious form. 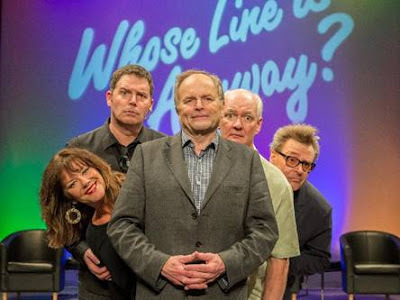 Host of the show, Clive Anderson, said: “I’m excited that Whose Line Is It Anyway?...Live will be returning to the West End this summer for more unscripted, unrestrained comedy in our biggest venue to date. Sunday night and indeed every other night at the London Palladium. I'll be firmly - sometimes not so firmly - in charge as host of the show and looking forward to the best, and worst, audiences will throw at our talented improvisers this time round"
Whose Line is it Anyway? shaped the landscape of TV comedy when it first appeared on our screens back in 1988 on Channel 4. The format of the show saw Clive Anderson host a panel of four highly-skilled comedians in the guise of a game show. The comedians would compete in a series of improv games, sculpted by suggestions from Anderson and the audience. The show went on to become an even bigger hit over in the US, where it began airing in 1998 and is still running to this day. Tickets for Whose Line is it Anyway?...Live are available through Ticketmaster and the London Palladium Theatre Box Office from Friday 18th March.